Lipases (EC 3.1.1.3) are carboxylic ester hydrolases that catalyse the hydrolysis of triacylglycerol to glycerol and free fatty acids [1Das A, Shivakumar S, Bhattacharya S, et al. Purification and charcaterization of a surfactant-compatible lipase from Aspergillus tamarii JGIF06 exhibiting energy-efficient removal of oil stains from polycotton fabric 3 Biotech 2016; 6: 131-6., 2Selvakumar P, Sivashanmugam P. Optimization of lipase production from organic solid waste by anaerobic digestion and its application in biodiesel production. Fuel Process Technol 2017; 165: 1-8. [http://dx.doi.org/10.1016/j.fuproc.2017.04.020] ]. Emulsified esters of glycerine and long-chain fatty acids such as triolein and tripalmitin were split by true lipases. Microbial lipases play an immense role in biotechnology because they are stable over a different range of pH, at high temperature and also in various organic solvents. Lipases are increasingly becoming popular for various industrial applications because of their diverse enzymatic properties and substrate specificities [3Rani A, Sharma A, Rajagopal R, Adak T, Bhatnagar RK. Bacterial diversity analysis of larvae and adult midgut microflora using culture-dependent and culture-independent methods in lab-reared and field-collected Anopheles stephensi-an Asian malarial vector. BMC Microbiol 2009; 9: 96. [http://dx.doi.org/10.1186/1471-2180-9-96] [PMID: 19450290] , 4Sangeetha R, Arulpandi I, Geetha A. Bacterial lipases as potential industrial biocatalysts: An overview. Res J Microbiol 2011; 6: 1-24. [http://dx.doi.org/10.3923/jm.2011.1.24] ]. Out of various sources fungi were potentially better for isolating different lipases with unique properties. Many fungal lipases producing microbes include Aspergillus, Geotrichum, Rhizopus, Mucor, Rhizomucor and Penicillium [5D’Annibale A, Sermanni GG, Federici F, Petruccioli M. Olive-mill wastewaters: A promising substrate for microbial lipase production. Bioresour Technol 2006; 97(15): 1828-33. [http://dx.doi.org/10.1016/j.biortech.2005.09.001] [PMID: 16236495] -7Mhetras NC, Bastawde KB, Gokhale DV. Purification and characterization of acidic lipase from Aspergillus niger NCIM 1207. Bioresour Technol 2008; 227: 680-5. [PMID: 18835775] ]. Lipases are versatile enzymes which are capable of valuable transformations in the different areas like organic chemistry, biofuels, oleo-chemistry and pharmaceutical industries [8Anbu P, Noh MJ, Kim DH, et al. Screening and optimisation of extracellular lipase by Acinetobacter sp. isolated from oil contaminated soil in South Korea. Afr J Biotechnol 2011; 10: 4147-56., 9Sharma A, Meena KR, Kanwar SS. Molecular characterization and bioinformatics studies of a lipase from Bacillus thermoamylovorans BHK67. Int J Biol Macromol 2017. [http://dx.doi.org/10.1016/j.ijbiomac.2017.10.092] [PMID: 29051101] ]. Filamentous fungi produce industrially important enzymes in batch and fed-batch cultures through submerged fermentation [10Colla LM, Primaz AL, Benedetti S, et al. Surface response methodology for the optimization of lipase production under submerged fermentation by filamentous fungi. Braz J Microbiol 2016; 47(2): 461-7. [http://dx.doi.org/10.1016/j.bjm.2016.01.028] [PMID: 26991270] ]. Submerged processes have some advantages such as higher homogeneity of the culture medium and can control temperature and pH as compared to solid-state processes [11Pandey A, Soccol CR, Mitchell D. New developments in solid state fermentation: I. Bioprocesses and products. Process Biochem 2000; 35: 1153-69. [http://dx.doi.org/10.1016/S0032-9592(00)00152-7] ]. The statistical optimization is more efficient in terms of cost and time consumption as compared to the method of changing one variable at a time [12Kaushik R, Saran S, Isar J. Statistical optimization of medium components and growth conditions by response surface methodology to enhance lipase production by Aspergillus carneus. J Mol Catal, B Enzym 2006; 40: 121-6. [http://dx.doi.org/10.1016/j.molcatb.2006.02.019] ], and also, the number of experiments can be less as well as the interaction among different variables can be studied simultaneously. Many researchers have carried out the study for the production of lipases by microorganisms by using these techniques [13Burkert JFM, Maugeri F, Rodrigues MI. Optimization of extracellular lipase production by Geotrichum sp. using factorial design. Bioresour Technol 2004; 91(1): 77-84. [http://dx.doi.org/10.1016/S0960-8524(03)00152-4] [PMID: 14585 624] -15Wang D, Xu Y, Shan T. Effects of oils and oil-related substrates on the synthetic activity of membrane-bound lipase from Rhizopus chinensis and optimization of the lipase fermentation media. Biochem Eng J 2008; 41: 30-7. [http://dx.doi.org/10.1016/j.bej.2008.03.003] ]. Plackett–Burman design is an efficient method that can be used for the screening of different variables for further optimization [16Rajendran A, Palanisamy A, Thangavelu V. Evaluation of medium components by Plackett-Burman statistical design for lipase production by Candida rugosa and kinetic modeling. Sheng Wu Gong Cheng Xue Bao 2008; 24(3): 436-44. [http://dx.doi.org/10.1016/S1872-2075(08)60024-2] [PMID: 18589 820] ]. The aim of this work was to find out the most significant parameters for the production of lipase by fermentation and to optimize parameters by using Response Surface Methodology. Plackett-Burman design showing the effect of various variables on the production of lipase from Aspergillus fumigatus. Samples were collected from different oil contaminated soil such as those from railway track, Himachal Road Transport Corporation (HRTC) workshop, dairy plant and garden soil in and around Shimla district, Himachal Pradesh. The production medium containing (w/v) Peptone 1.5%, NaCl 0.5%, CaCl2 0.1% and Tween 80 1% [17Sneath PHA. Bergeys manual of determinative bacteriology 1986.] was autoclaved at 15 lb/inch2 pressure in 121°C for 15 min and cooled at room temperature. The sterile production medium (50 ml in 250 ml Erlenmeyer flask) was inoculated with 2.4 ×105 spores and incubated for 3 days at 37°C. The culture broth was checked for enzyme activity. Assay method given by Winkler and Stuckmann (1979) was used for lipase activity [18Winkler UK, Stuckmann M. Glycogen, hyaluronate, and some other polysaccharides greatly enhance the formation of exolipase by Serratia marcescens. J Bacteriol 1979; 138(3): 663-70. [PMID: 222724] ]. One unit of lipase activity was defined as the amount of enzyme required to release one micromole of p-nitrophenol from the substrate per minute under standard assay conditions. where E is the effect of the tested variable and M+ and M- are responses (enzyme activity) of trials at which the parameter was at its higher and lower level, respectively, and N is the number of experiments carried out [19Bhatia SK, Mehta PK, Bhatia RK, Bhalla TC. An isobutyronitrile-induced bienzymatic system of Alcaligenes sp. MTCC 10674 and its application in the synthesis of α-hydroxyisobutyric acid. Bioprocess Biosyst Eng 2013; 36(5): 613-25. [http://dx.doi.org/10.1007/s00449-012-0817-y] [PMID: 22945851] ]. The concentration of various independent parameters which showed a significant effect (galactose concentration, peptone concentration, pH and incubation time) on lipase production was optimized by central composite design (CCD) [20Xiao ZJ, Liu PH, Qin JY, Xu P. Statistical optimization of medium components for enhanced acetoin production from molasses and soybean meal hydrolysate. Appl Microbiol Biotechnol 2007; 74(1): 61-8. [http://dx.doi.org/10.1007/s00253-006-0646-5] [PMID: 17043817] ]. Effect of different parameters on lipase production by using Plackett-Burman design. Table 1 shows the value of six parameters and their responses to lipase production. Experiments showed variations in activity from 2.38 to 9.51 U/ml and run 10 was found to be optimum which exhibited the maximum activity of 9.51 U/ml. Pareto chart was formed by results obtained from Plackett-Burman with six variables (Fig. 1 ) to find out the significant variables. In an earlier study, sunflower oil, glucose, peptone, agitation rate, and incubation temperature were the most significant variables for the production of lipase from Aspergillus carneus [12Kaushik R, Saran S, Isar J. Statistical optimization of medium components and growth conditions by response surface methodology to enhance lipase production by Aspergillus carneus. J Mol Catal, B Enzym 2006; 40: 121-6. [http://dx.doi.org/10.1016/j.molcatb.2006.02.019] ]. The optimization of lipase production by using the stepwise experimental design of fungus Aspergillus flavus showed that the 100 g/L wheat bran was present in the culture medium and 20 g/L soybean oil as the inducer [10Colla LM, Primaz AL, Benedetti S, et al. Surface response methodology for the optimization of lipase production under submerged fermentation by filamentous fungi. Braz J Microbiol 2016; 47(2): 461-7. [http://dx.doi.org/10.1016/j.bjm.2016.01.028] [PMID: 26991270] ]. 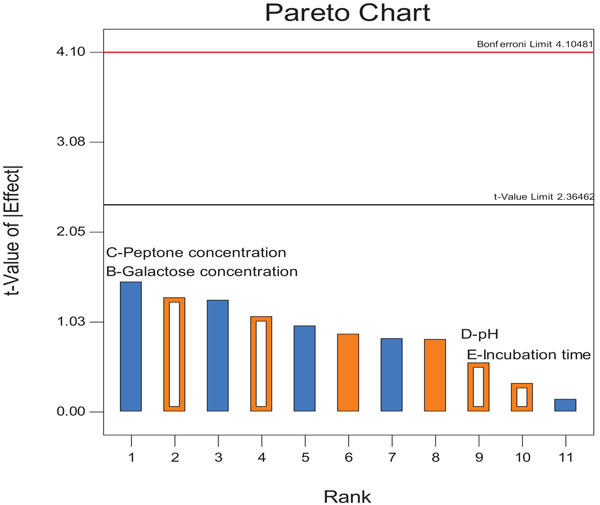 A central composite design (Table 2) was prepared for variables having a positive effect as shown in Pareto chart for determining the optimum level and to analyze the combined effect of variables (concentration of peptone, galactose, pH and incubation time). There were 30 experimental combinations for four significant variables obtained by CCD. In another study, the three factors (sunflower oil, glucose, and agitation rate) influenced the lipase production as obtained by response surface methodology [12Kaushik R, Saran S, Isar J. Statistical optimization of medium components and growth conditions by response surface methodology to enhance lipase production by Aspergillus carneus. J Mol Catal, B Enzym 2006; 40: 121-6. [http://dx.doi.org/10.1016/j.molcatb.2006.02.019] ]. The model was analysed and used to generate the ANOVA (Table 3), showing that the model was highly reliable. The cubic process was found to be good and the model was significant (Table 4). Effect of positive factors obtained from Plackett-Burman in CCD. Model analysis using ANOVA test. Lack of fit for CCD showing model summary. 3D Response surface plots of the various parameters on the optimal production of the lipase. The variables studied were incubation time, peptone concentration, galactose concentration and pH. (A) The impact of incubation time and peptone concentration on lipase production (B) The impact of incubation time and galactose concentration, (C) The impact of pH and galactose concentration on lipase production. The 3D response graphs were obtained by regression analysis of CCD design data using a different combination of four significant factors for lipase production Fig. (2 A-C ). The response surface graphs were more or less hill shaped and showed interactions among variables with optimum activity around concentration of galactose 1.5% (w/v), peptone 1.8% (w/v), pH 10.0 and incubation time 72 h. There was moderate interaction between peptone concentration and incubation time (Fig. 2A ). Neither high nor low concentration of peptone and incubation time gave higher enzyme yield. Peptone at a concentration of 1.8% and incubation time of 72 h gave an optimum yield of the enzyme but incubation time had a distinct impact on enzyme production in comparison to peptone concentration. In a recent study, lipase form tolerant Rhizopus sp showed maximum lipase activity in the presence of peptone (2%, w/v) [21Riyadi FA, Alam MZ, Hamzah MNS. Optimization of thermostable organic solvent–tolerant lipase production by thermotolerant Rhizopus spp. using soild state fermentation of palm kernel cake 3 Biotech 2017.]. In other studies, 72 h was reported as the optimal fermentation time for Aspergillus niger lipase grown in solid-state fermentation, with a subsequent decrease in activity seen at 96 h and 120 h [22Kamini NR, Mala JGS, Puvanakrishna P. Lipase production from Aspergillus niger by solid state fermentation using gingelly oil cake. Process Biochem 1998; 33: 505-11. [http://dx.doi.org/10.1016/S0032-9592(98)00005-3] , 23Mala JGS, Edwinoliver NG, Kamini NR, Puvanakrishnan R. Mixed substrate solid state fermentation for production and extraction of lipase from Aspergillus niger MTCC 2594. J Gen Appl Microbiol 2007; 53(4): 247-53. [http://dx.doi.org/10.2323/jgam.53.247] [PMID: 17878664] ]. 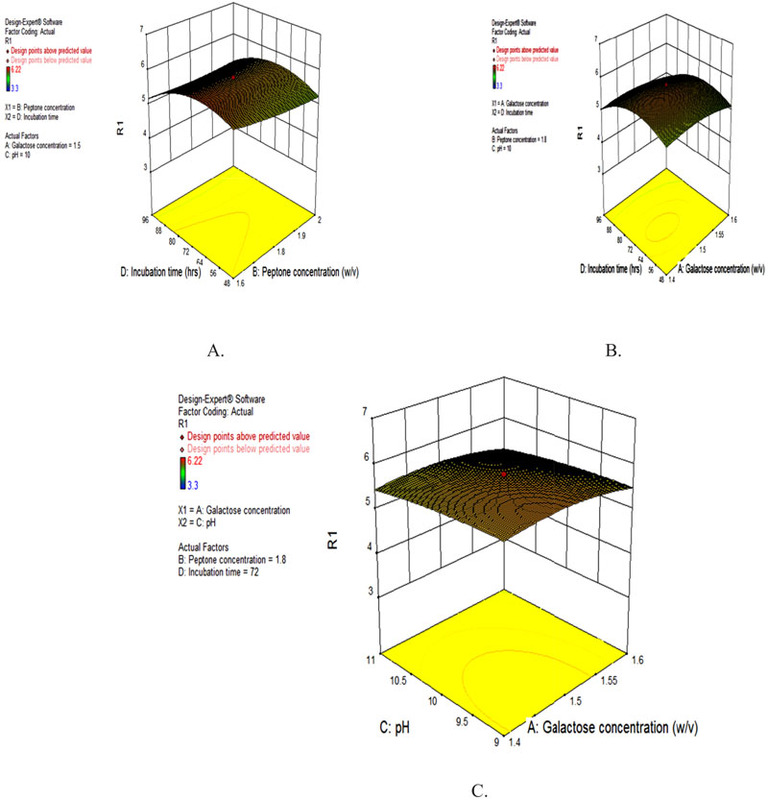 There was a moderate interaction between galactose concentration and incubation time (Fig. 2B ). Galactose at a concentration of 1.5% and incubation time of 72 h gave an optimum yield of the enzyme but incubation time had a distinct impact on enzyme production in comparison to galactose concentration for the production of lipase. Neither high nor low concentration of galactose and pH gave higher enzyme yield. Galactose at a concentration of 1.5% and a pH of 10.0 gave an optimum yield of enzyme lipase (Fig. 2C ). The model was very significant as suggested by ANOVA which was evident from the coefficient of variation (CV%=4.01) and low-pressure value (2.93) Table 5. The coefficient of determination (R2) (0.9264) suggested that the model was significant with the obtained values, which was better than R2 value of the 0.81 and 0.91 for lipase production from Burkholderia sp. C20 and Candida sp. 99-125 [24Chien-Hung L, Wei-Bin L, Jo-Shu C. Optimizing lipase production of Burkholderia sp. by response surface methodology. Process Biochem 2006; 41: 1940-4. [http://dx.doi.org/10.1016/j.procbio.2006.04.013] , 25Yao-Qiang H, Tian-Wei T. Use of response surface methodology to optimize culture medium for production of lipase with Candida sp. 99-125. J Molecular Cata B: Enzymatic 2006; 43: 9-14.]. A perturbation plot shows the optimum values of variables for lipase production from Aspergillus fumigatus (Fig. 3 ). Perturbation plot helps to compare the effects of all the significant variables at a particular point in the RSM design space and response is plotted by changing only one variable over its range, while holding all other factors constant. Perturbation plot for all variables considered in CCD on lipase production. Predicted and actual response values comparison of lipase production. 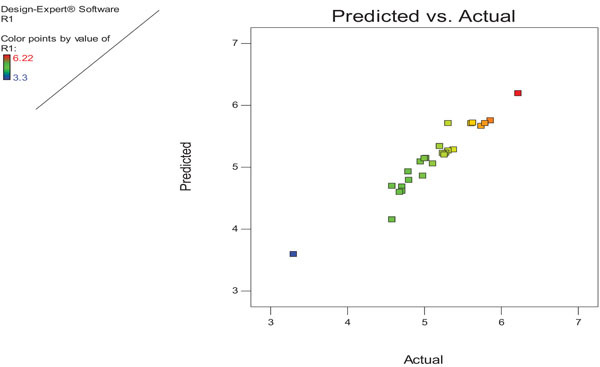 The RSM adequacy was shown by comparing the experimental data and the predicted values, by generating a fitted line plot for the obtained results, showing its closeness or deviation from the fitted line. The experimental and predicted values are shown in Fig. (4 ). As calculated by ANOVA, the activity was obtained with an experimental value of 6.22 U/ml, which is nearly related to the predicted value of 6.20 U/ml. 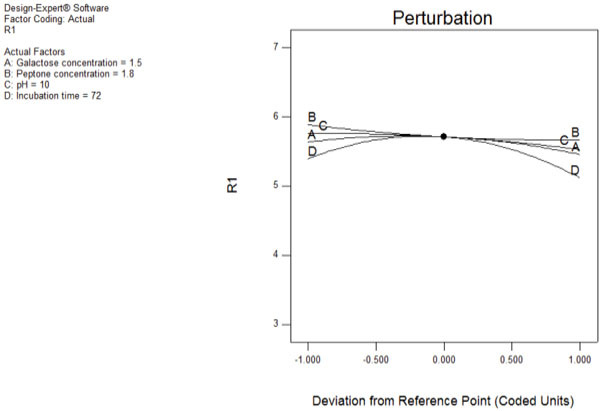 Perturbation plot shows the optimum value for variables such as: galactose concentration 1.5% (w/v), peptone concentration 1.8% (w/v), pH 10.0 and incubation time 72 h. There was a 1.4-fold increment in lipase production by performing statistical analysis.